It may not be "Green Eggs and Ham" but this dish sure sounded good to me... and it sounded fairly easy to make. 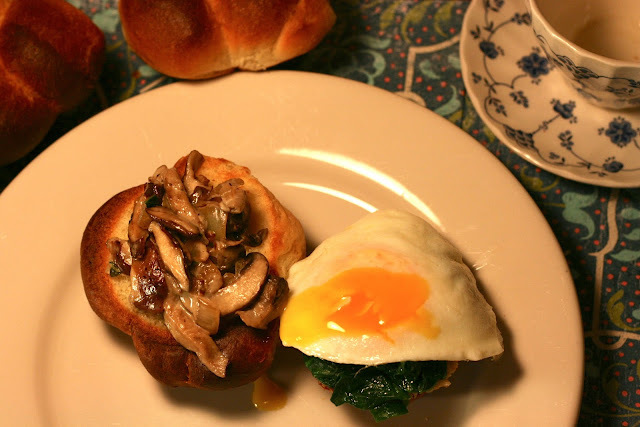 Well, it was easy to make because my little baker made the Bubble-Top Brioche that the eggs and mushrooms sit upon. 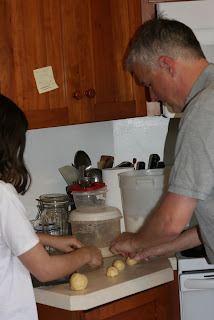 My daughter showing my husband how to make brioche. Of course being Miss Simple Living I made the recipe even easier by just frying the eggs instead of poaching them. I really don't see much difference in the taste of an over easy egg verses a poached egg. As long as the egg runs you get the same effect... which is delectable. Yolk running into cream, mixing with mushrooms, and billowy buttery brioche. The only thing I would change about the recipe next time is to double the cream. There really wasn't enough gravy...more gravy is always better. I also included spinach, that was just sautéed with a little bit of olive oil for contrast, and I will do this again. There were no, "strangely good" comments from The Peanut Gallery only the sound chewing happy eaters. Looks and sounds just delicious to me!! Really easy to make... well minus the brioche which for you wouldn't be hard to make. That looks very yummy! I haven't poached eggs very often, but I think it's a pretty cool effect. This works really well with over easy eggs... you don't have to poach them. Well I am quite impressed with the little baker in your househod. That brioche looks about perfect. I guess a runny egg is a runny egg no matter if it is fried or poached. Yours looks quite similiar to mine, fried or otherwise. Have you read Ruhlman on poaching eggs (via Harold McGee) in his book, Ruhlman's Twenty? His method is completely different than Dorie. I just found that interesting because with the basics, most good cooks are pretty close in the techniques, I think. Whatever, I thought this recipe was tasty also. The brioche really was perfect. She has been baking with my husband since she could walk... now at 11 she is amazing. I think we need to make this dish again this week. I had oral surgery today and will be eating soft food for about a week. I'll have to check out the poaching techniques. I thought there was vinegar or no vinegar. Your baker does look like she is ready to take on the world. The great thing about this non-recipe recipe is the concept - it doesn't seem to matter what bread you use or how you cook your eggs; it's all good! yes, and if you have a day old loaf of bread, just toast it and the runny eggs and mushrooms work no matter what. Oh Diane, I am so impressed that your eleven year old made brioche! All I can say is WOW!! They look wonderful and so does your lovely dish of Creamy Mushrooms and Eggs. The spinach sounds like a perfect side. This just reminded me I still have some brioche dough in my freezer…hummmm! 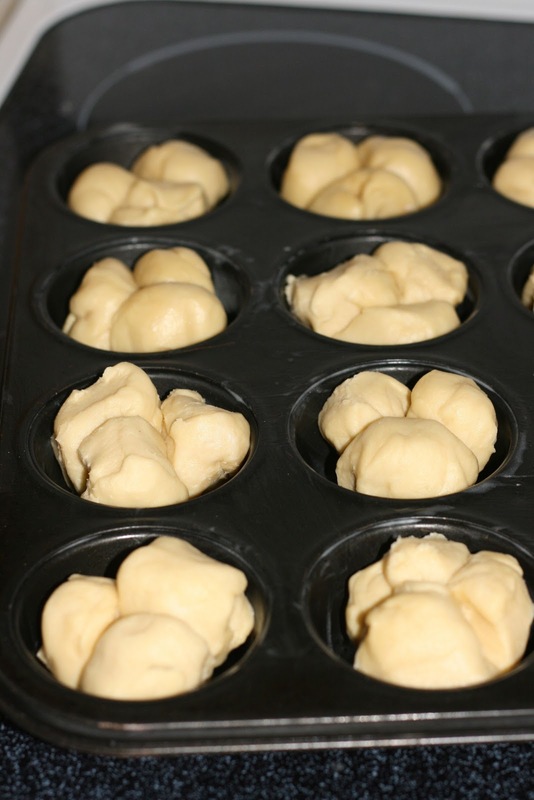 When I saw her rolling the individual pieces to put together for the mini brioche I thought so complicated. She said it was nothing. Definitely try it with brioche the sweetness is a nice compliment to the dish. I agree... I could see a creamy scrabble egg working too. I didn´t make enough mushroom gravy either, but there will always be a next time with this recipe. It looks wondeful Diane! I´ve had my share of fried eggs growing up, and there´s no denying how great they are. Yes, a next and a next time. Diane, I am quite impressed as well that your eleven-year old is already such an accomplished baker - respect! And your creamy mushrooms and egg look wonderful - my first choice was to go with spinach too, as it makes a wonderful companion to the other ingredients of this dish! What a wonderful "family effort"! Hope you will be feeling better soon - take care! Thank you Andrea... I'm obsessing about all the foods I can't chew at the moment. That bread looks amazing, you must be very proud of your daughter. This was a lovely dish and will certainly be repeated. I was really surprised at how easily she put it all together. Thank you I am very proud of her. 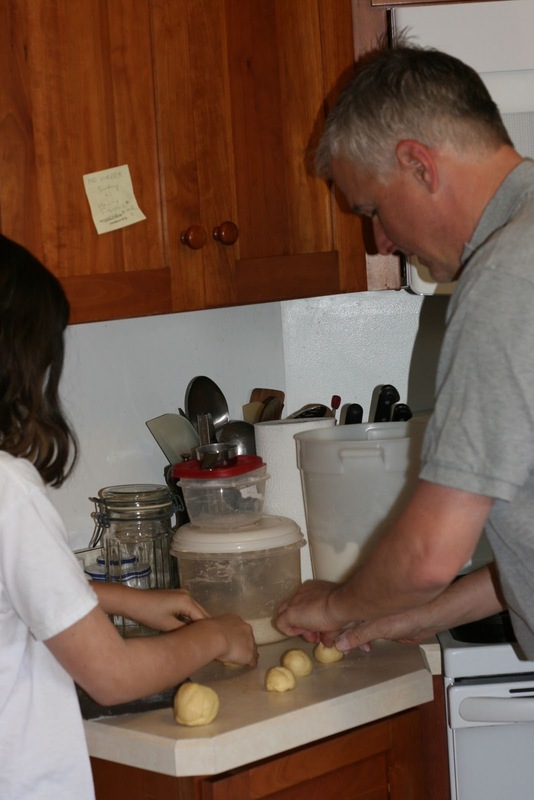 So impressed with your little baker - those brioche buns look perfect. I also like your addition of spinach to this dish. It sounds delicious. Thanks yes, I think my daughter and husband should start a bakery.. or maybe we can have a breakfast place where I'll refuse to poach eggs. LOL. The spinach was a really good counter to the mushrooms. I've decided the only difference between a poached egg and a fried one is the calories. Otherwise, they are interchangeable. Spinach is one of my favorite vegetables, so I'd say your addition of it to this is gilding the lily. I really loved this one myself. And the difference in time to make. You have to boil water and do fancy swirling for a poached egg. The spinach did work well, one of my favorites too. This is definitely a quick meal to make when you are really hungry. I knew I should have stayed in Dorie's group. This recipe alone makes it worth it. Your eggs look perfect. Who needs poaching? Come back... quite a few people just pop in every once in a while. No pressure. I'm so impressed that your daughter makes brioche! I don't think I attempted baking with yeast until my 20s. It came out beautifully, too. I'm glad you all enjoyed the recipe. I have never been successful baking. She didn't get the baking gene from me. One of my grandmother's used to bake gorgeous cookies for weddings... she must have got it from her and my husband who is a terrific bread baker. So true... I really am starting to look at my ingredients differently. Dorie has truly given me a new perspective and a lot of expensive spices that I feel the need to use. What a great family affair! The brioche looks wonderful. Nice that you all have your talents! Yours is making this dish look amazing! So happy you liked it. I thought it was terrific. I like your idea of the spinach too. Thanks so much... it is great that we all have different talents then we can cover a full meal. My son's speciality is eating.. which is most important. Perfect for Mothers Day Brunch, lovely Diane. Thank you so much for sharing this awesome recipe with Full Plate Thursday. Hope you have a very special Mothers Day Weekend and come back soon! What a delicious breakfast! 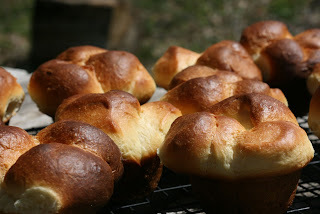 I love those bubble top brioche, and they would be so delicious with the creamy mushrooms and eggs.